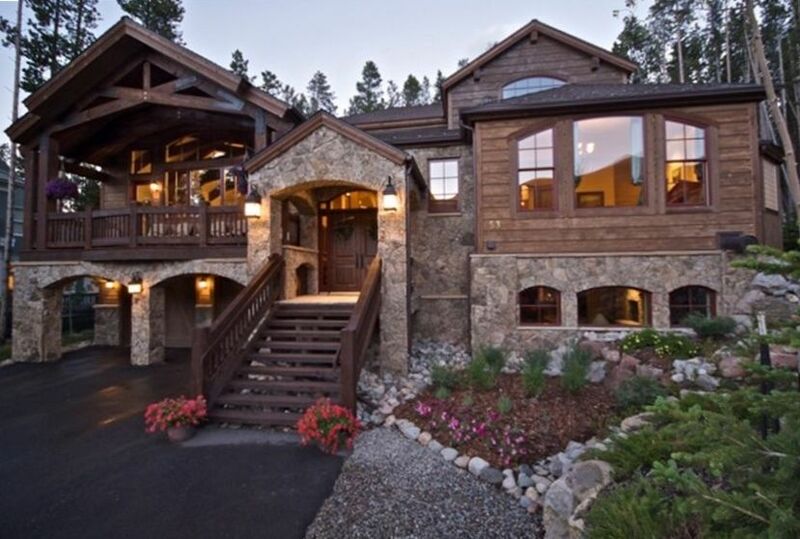 This exclusive mountain home has the appearance of a European Lodge newly constructed in 2008, this property is located in a ski-in, walk-out private cul-de-sac surrounded by multi-million dollar homes at the base of Peak 8. The interior of this home is decorated in a European rustic motif. On the garden level, for your enjoyment there is a Theater with 100 inch screen and surround sound, pool table/ping pong, pub, steam room, wine room and fireplace. There is also one bedroom with 2 queen beds. The main level includes three fireplaces, a massive great room with wet bar, new 65' LG smart tv, gourmet kitchen (Wolf & Sub Zero), dining room, breakfast bar, sitting room, laundry room, deck with private hot tub and outdoor grill. The master suite is conveniently situated on this level and includes a wet bar, steam shower and has incredible mountain views. There are sprawling flagstone & wood floors throughout this level, with warm radiant heat. The southwest facing deck has the sunniest and best Views of Peaks 7 & 8 in Breckenridge! The upper level has three large bedrooms with private bathrooms & flat screen TV's. In addition, there is a secluded den with a queen sofa sleeper (real mattress), with fireplace and built in bunk beds each with a flat screen TV. This area gives the home another cozy retreat and the feel of a private mountain villa. A centrally located Elevator allows easy flow throughout the house. This house includes every possible top of the line exclusive amenity. Perfect for family vacations, reunions, corporate retreats. You will love your stay, you will not ever want to leave!!! *NEW - EUROPEAN/RESORT STYLE BEDDING: Down comforter folded between two fresh sheets. We built the house to live in as residents of Breckenridge for 35 years. Our home is rented just a few weeks throughout the year so it is kept in immaculate condition. Exclusive Boulder Lodge is at the Base of Peak 8, just a few steps from the new Ski Area expansion with access to all their new amenities, Restaurants, etc. Ski back to the house using our unique Homeowners Ski Easement. We have absolutely the best view and sunniest deck on Peak 8 !!! (2) Front Covered Deck has a sitting area with direct unobstructed views of the Ski Slopes. The Back covered Deck has the Hot Tub and BBQ Grill with seating as well. Five Fireplaces, 13 Cable TVs, DVD, Theater- SONOS Surround Sound, Full Gourmet Kitchen, 2 Microwaves, 3 Dishwashers, 3 Refrigerators, Ice Makers, 2 Steam Rooms, Table Tennis option on pool table, Elevator. Ski in access. Great house with close access to ski lifts and easy walk to gondola to take free transportation into the town of Breckenridge. The home is even better than the pictures! Brought my family of 10 for a week skiing vacation. It was a vacation to remember. The home is gorgeous. Everything was top of the line and worked perfectly. The views were spectacular of Peak 8. What a fantastic time. Will be back again, hopefully this home will be available. Third time to stay, always love it! Dave keeps a well run luxury rental. This was our hockey team's third consecutive year to rent Boulder Ridge Lodge and we love it more and more each time. Great communication with owner and received exactly what we wanted! Thanks Dave! House was amazing & location was perfect! Views are gorgeous! We took a family trip, total of 3 families, this house was perfect! Stayed 5 nights. Game room & theatre room provides lots of entertainment. I would recommend to anyone! was a wonderful getaway for us.!!! the view of peak 8 from front porch was awesome. the home was lovely and had numerous amenities. due to an unexpected injury prior to arrival that left one of our crew on crutches, the elevator was a godsend. thank you dave for allowing us to celebrate hubbys 60th at your home. Our family stayed in this lovely home to celebrate my father's 80th birthday. We ranged in age from 8 - 80 with something to do for every age. My brother is confined to an electric wheelchair, and it was so refreshing for him to be able to get to all three floors in the house via the elevator to enjoy the ground level billards contest, movies in the theater room, meals and living room on the main floor and sleep in a 3rd floor bedroom. 4 minute walk to the alpine slides, and 11/2 miles walk into town. Hot tub had fresh water in it when we arrived and was used nightly. A FANTASTIC kitchen supplied with everything you could possibly need from 4 drawers of spices to a food processor, kitchenaid mixer, and slow cooker! There is a fancy built in coffee machine, that everyone enjoyed, so bring your whole bean coffee! The owners had our damage deposit (along with a pair of sandals I had left and not had time to request they look for and return)back to us in 4 days! Not one negative thing to say about our experience! We hope to return when my mom turns 80 in a couple years! Thanks again for a very memorable experience! !